I initially tried Kirschbaum Pro Line Evolution 17 because a friend of mine recommended that I give them a playtest. I decided on the Kirschbaum Pro Line Evolution 17 tennis string to review, partly because it was a newer tennis string for 2011 and partly because I like the blue color of the string. The Pro Line Evolution only comes available in a 17 gauge, where I prefer the feel and playability of a 16 gauge. Regardless of the thickness of the tennis string, I was pumped and ready to try out this neat colored tennis string. I strung the Pro Line Evolution at 52lbs, to get some additional pop off my groundstrokes. The stringing process was very simple, not once did I get a kink or anything; although I did notice that the strings felt a little “slimy” so weaving the crosses required a little more effort and attention than other strings. 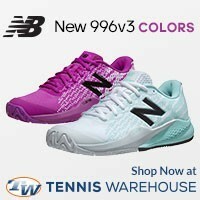 I was pretty impressed how the light blue color of the Kirschbaum Pro Line Evolution looked on my Donnay X-Dark Red 94. 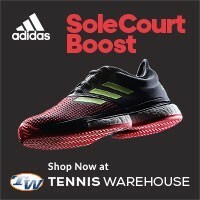 When I got out on court, I was looking forward to getting warmed up to see what the string could do on the ground. The string description says the Kirschbaum is a softer feeling polyester string that offers great ball pocketing and access to spin. So you could imagine that I was going to rip on the ball to see what kind of spin and pocketing I could get from this polyester tennis string. 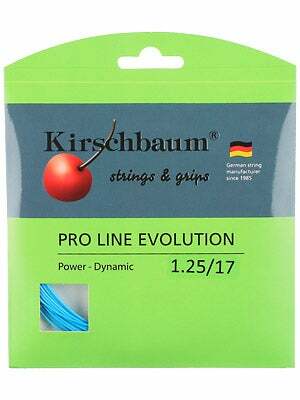 My personal opinion of the Kirschbaum Pro Line Evolution is right in the middle of the road as far as tennis strings go. I’m not really in love with this string and I don’t hate it (that much). I struggled to get the spin that I was looking forward to, though the lack of spin was offset by the pop I was able to get on my groundstrokes. I was felt a little let down by the Pro Line Evolution, I was expecting great things, however; they under performed when I needed a high performance string. Even with the lack of spin, I very much enjoyed hitting flat with this strung in my tennis racquet. The ball sat on the strings (pocketing) long enough for me to direct the ball on flat strokes, which is always nice. However, I like to hit with heavy spin and am less consistent when only hitting flat, so I found that I was making a ton of errors which is extremely frustrating. Probably my favorite factor of the Pro Line Evolution was how the strings behaved on touch shots. 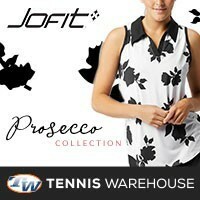 Going to net and having to hit a few firm volleys were magnificent! Dropping a volley right on the other side of net with some decent backspin was easy to come up with and quiet entertaining as I watched my hitting partner try and catch up to the ball. As the Pro Line description says, it’s a softer polyester; so I was expecting little to no soreness in the arm after hitting for a few hours…got what I expected. I had just general muscle soreness the day after using this string, though it was nothing painful. It is safe to say that the Pro Line Evolution is an arm friend tennis string. Kirschbaum claims that this a very durable tennis string because they pre-stretch it at the factory. 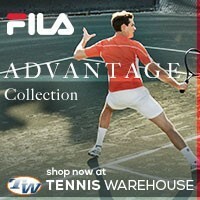 Do I believe that it’s more durable than other tennis strings that haven’t been pre-stretched? Not really. After about 4 hours of play, the Pro Line began to move around on me quite a bit, even on less powerful strokes. At the end of the 4th hour, the Pro Line began to get that dead feeling and began lacking the pop that I was getting an hour prior. Do I recommend the Pro Line Evolution? Sure, I mean, if you are a flat hitter and like to play at net or have arm issues, this string is perfect for you. However, if you are an aggressive baseliner, then I would caution you on this particular tennis string, use it in a hybrid with something a little more spin friendly in the crosses.